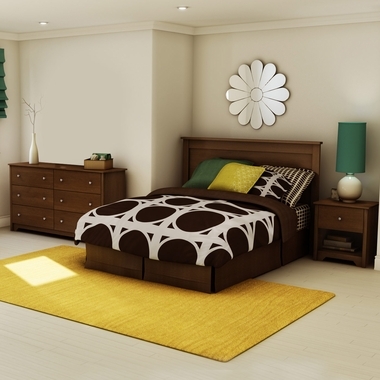 Minimalist style of this Vito Bedroom Set in Cherry from South Shore creates a beautiful room for your big kid. The Vito Full/Queen Headboard features crisp refined lines that add a touch of elegance to the room. It is designed to be attached to the full/queen platform bed (3159217 sold separately) and can also be attached to a standard full (54��) or queen (60'') metal bed frame. The Vito Double Dresser and Night Stand in Cherry finish complete the modern elegance of the room with excellent storage space. Six spacious drawers on the Vito dresser are embellished with knobs in a matte nickel finish and a decorative kickplate. The drawer space meets your kid's needs for storing away folded clothing and accessories. Multiple drawers allow your kid to learn the value of organizing belongings such as being able to find something without yelling for mom. 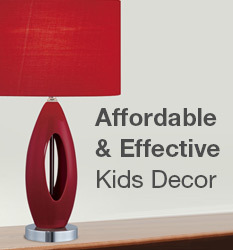 Kids enjoy night stands to keep all the stuff they like to look at once more before falling asleep. The drawer and open compartment on the Vito night stand are perfect for books, CD's, games, journal, pens and more. South Shore safety includes gentle rounding of edges and corners for child safety plus drawers featuring polymer slides with a stop notch and shock absorbers for greater safety. Made from non-toxic laminated particleboard. This product is safely protected for transport and brings you a five year quality guarantee. At South ShoreTM Furniture, we believe that when it comes to helping the environment every little bit counts. It is also our priority to manufacture products that will not harm consumers� health. All our furniture is manufactured using particle board and MDF that are made entirely from recycled fibers. Our Eco-Armor packaging is made of recyclable materials only and furniture is nearly 85% biodegradable by weight. This piece of furniture meets or exceeds North American safety standards, and we've tested and inspected it as we would for our own kids.